lunchbox menu for thurs. june 12 | the pedalling pixies. well, we’re finally doing it! we’re hitting the streets of cobourg this week delivering some delicious homemade grub to your office or front door! it’s simple …. choose one of the two menu items below, fill out the order form and flip us a tenner when we deliver your lunchbox on thursday, june 12! all orders must be placed by 12pm on wednesday. 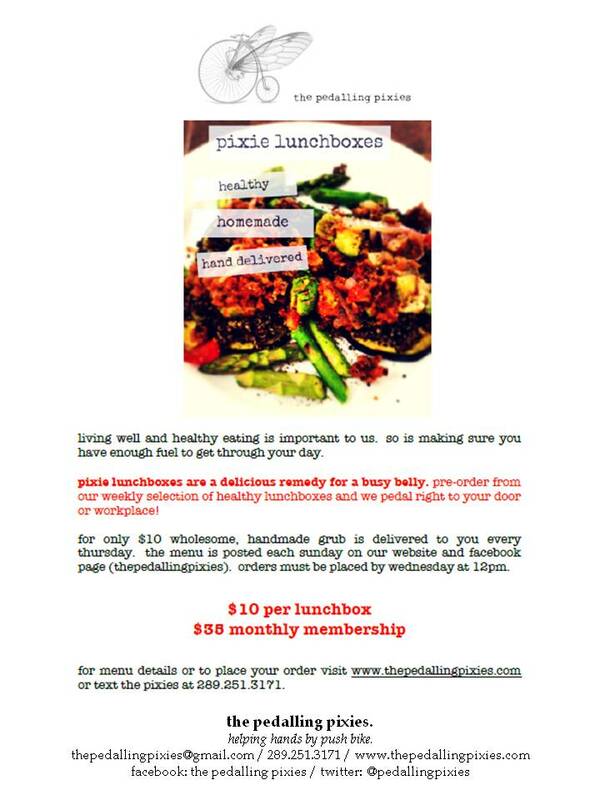 lunchboxes will be delivered between 1130am and 1pm. a vegan’s take on the classic summer sandwich! crumbled tofu tossed with cayenne, turmeric and sweet onion. served on fresh bread from millstone bakery with a side of mixed greens. no–thank you rhonda! oh you are a darling! always so lovely to see your radiant self :). be seeing you again soon then! !